This weeks Teaser Tuesday comes from Iron-on Constellations by author Emily Pohl-Weary. Iron-on Constellations defiantly explores the beauty and complexity of the everyday. Through short, confident bursts that act like graffiti on an alley wall, award-winning author Emily Pohl-Weary’s poems reveal hidden layers of emotion and political motivation. She sifts through the surface dirt, grime and debris of the city to reveal the isolation, illness, love and sexuality lurking beneath. Iron-on Constellations can be purchased from Amazon.com, or your favorite book store. Come speak to me professionally. I know it’s your job. I fall in love with movie stars. Everyone loves a hero for a week. the way you did that exam in semi-darkness. I stay sane this way. a blond memory o hospital. 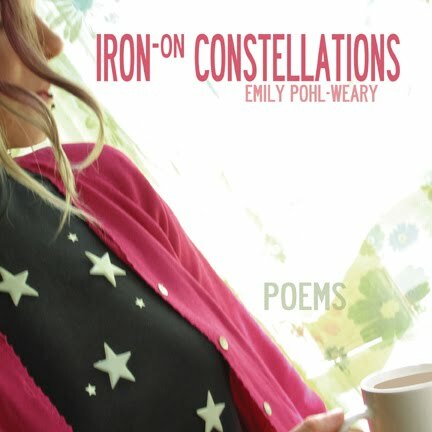 This week’s Teaser comes from Iron-on Constellations a collection of poems by author Emily Pohl-Weary.